Can a hero be cool without killing? What is a superhero? What separates an ordinary hero from a superhero? Is it a cool costume? A name? A comic book, a cape? When I was a kid the lines between good guys and bad guys were clear. The Punisher didn’t exist. Tony Stark never had a drink. The fact that Batman carried a gun in the forties was a secret everybody wanted to forget. Batman never crossed that line. He hated guns. Today it appears Batman’s gun is part of his costume. In 1985 when I saw Michael Keaton’s Batman killing guys, I nearly jumped from my seat. 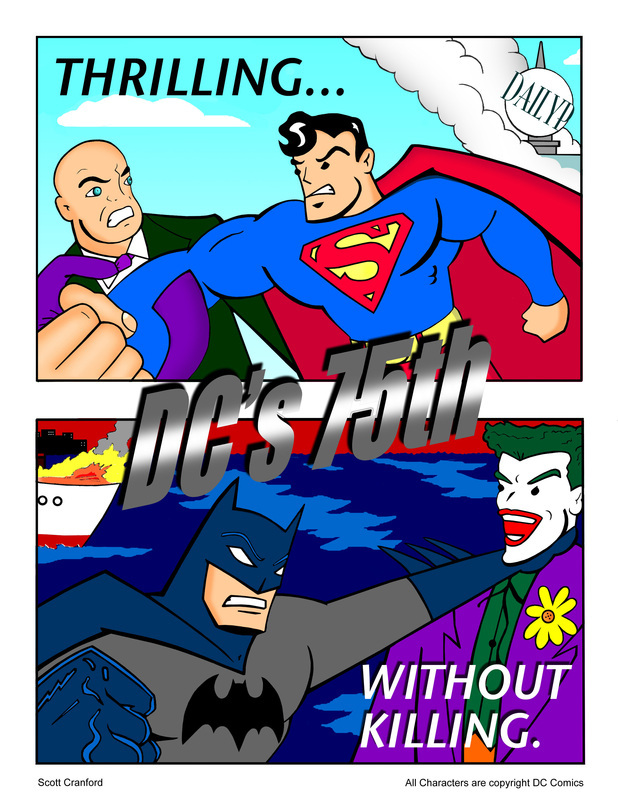 In 2010 DC Comics was celebrating it’s 75th Anniversary. The anniversary was the theme of the upcoming SanDiego Comic Con souvenir book. I love the DC superheroes and I wanted to get a piece of art in that book. I needed a slogan that summed up what was most unique about DC Comics. I had done “Light-Speed, Indeed” for Flash and Green Lantern’s anniversary and “60 year vet, not one regret” for Captain America, but generalizing a superhero company in a few words was a heroic challenge. Finally it came to me, Thrilling without Killing. What was most unique about DC Comics was that their superheroes didn’t kill. Often in battle they would come close but they’d stop before the moment and remind themselves that they are better than their aggressor. I liked that DC’s heroes didn’t kill. I am not anti-death penalty. I don’t want to see the lowest of the low sharing this good world with the rest of us. But what I want from a hero is someone better than me. A hero sets a standard that I can strive toward. DC Comics is getting ready to deliver a gritty new Batman and Superman. Today Superman is being re-introduced wearing a t-shirt with blood on his boots. He looks like a brawler, the kind of guy Superman puts away. Far from the father figure he once was. A Batman game is set to emerge with an M rating. I am a father of an eleven year old who loves video games. He doesn’t share the passion for superheroes that I do but we enjoy the Batman video games together. It boasts the first time you can drive the Batmobile. We won’t be playing this game. Because of the rating my son doesn’t want to play it. Violent heroes are nothing new. When Captain Marvel was first introduced in 1941 on the big screen he was gunning down bad guys and throwing them off buildings. Times change but right and wrong remain the same. ﻿It comes down to the choices of the creators. Whether you are a director of a big budget superhero movie, a comic book writer or a fan-filmaker on a zero budget production, if you are handling iconic superheroes that millions of children look up to, make them act responsibly. What they do and say can have a tremendous effect on children’s thoughts, desires and how they behave. Why was Clark Kent drinking beer in both Superman Returns and Man of Steel? Nothing against beer, but can’t there be one guy who is above it. Shouldn’t a superhero try to set a moral standard even if he is in his secret identity. If I’m a kid and I learn that Superman is down on booze, I’m going to be down on booze. I may go on to drink, but my hero is always going to hold that gold standard. It is amazing how many “Superheroes” in big budget "Superhero" movies barely do anything heroic. In some, they are the cause of the problem. The blurry line of what makes up a Superhero worries me. Looking cool has become more important than doing right. I'm all for gritty superheroes but we need happy ones too. I don’t want to see gritty become the norm. That's not what superheroes are about. When Superman snapped Zod’s neck in Man of Steel, I was sadly kind of numb to it. The direction things were going, I was not too surprised. What did surprise me was the audiences reaction. People didn’t want to see Superman kill. That gave me hope. In Superman 2, Christopher Reeve's Superman grapples Zod into a headlock but Man of Steel's Superman delivers a much different result. Superman has always been my favorite superhero. I was fortunate to have been able to portray him professionally on more than one occasion. The biggest thing about Superman for me was the morals. As part of a goodwill tour for the U.S. Army, I read a book to hundreds of children called, Superman's Book of Morals. I was elated to see that there wasn't one child that was not hanging on my every word. Doing right is something we can all relate to. People don't want Superman to be dark. They want a boy scout. Around the time Superman Returns was coming out I was working at an event as Superman. The day started off with hundreds of both traditional and Superman Returns costumes. Near the end of the day a mother came up to me and asked where she could get a Superman suit. I said there is a bunch there. She said "not the dark one, one like yours". I looked over and all the traditional suits were gone while almost the entire inventory of the Superman Returns suits remained. Brandon Routh in Superman Returns. Author Scott Cranford talks to children as Superman about the importance of having good morals. Henry Cavill reveals a much brighter Superman suit. Superman Returns was criticized because of Superman's scruples and a lack of action. Man of Steel tried to make up for the latter by delivering plenty of fight. It turns out what people want most is heroics. After sifting through the action, fighting and spectacle of Man of Steel, when advertising the picture, the 30 second spot came down to good old fashioned heroics, Superman catching a falling soldier. There was an article in which Man of Steel director Zack Snyder discusses how he learned that fan's cling to the Christopher Reeve version of Superman. My guess is that the next incarnation will present a more righteous Superman. Pictures from the upcoming Batman V. Superman already reveal a lighter Superman uniform. (UPDATED). Okay, maybe Justice League? Batman director, Tim Burton stated recently that there have been enough dark superheroes and it is time for lighter superheroes. This coming from the man who helped define the dark superhero. Is he right or is this just remorse over what has happened to the superhero? Will our thirst for blood in entertainment continue to be stronger than our instinct to look out for those more vulnerable? If we reject seeing our heroes fail us, maybe they no longer will. As always, my faith remains in heroes. "Thrilling without Killing" author Scott Cranford is the President of www.Heroicworld.com. You can read about his portrayal of Superman here.